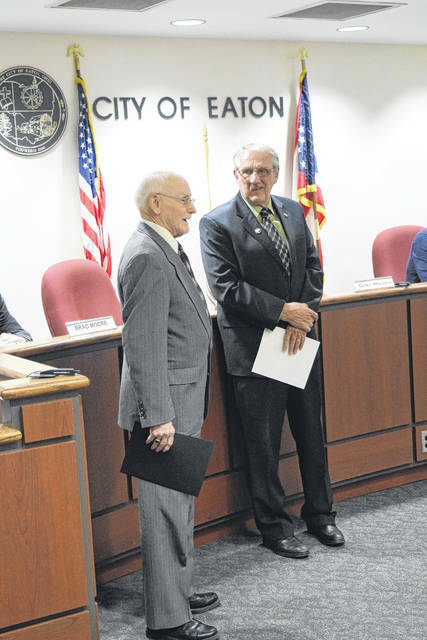 Eaton City Council recognized Pastor Lowell Spencer for his longtime service during their meeting on Monday, Feb. 19. 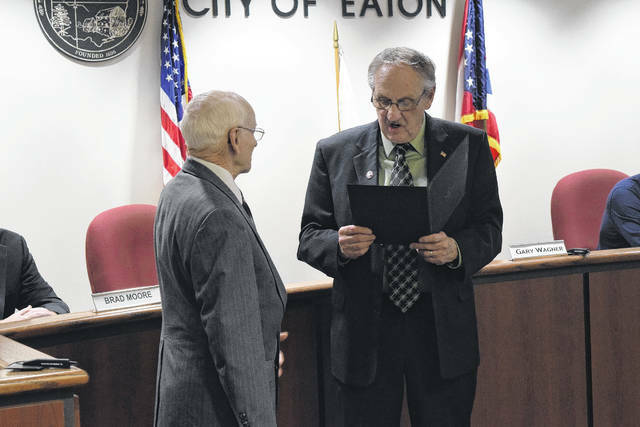 EATON — Eaton City Council recognized Pastor Lowell Spencer for his longtime service during a meeting on Monday, Feb. 19. Spencer was born in Kentucky, but his family moved to Eaton, where he graduated in 1954. He was active in football, baseball, and track. He even won the State 440 Title in 1954. A year later he married Carol Fouble. Spencer went to work at Eaton Baptist Temple in January of 1964 and served as music director and Sunday School Superintendent with Pastor Lynn Randall until he accepted the position of Pastor in 1966. Spencer retired from that position in late 2017. During the council meeting on Monday, Eaton Mayor Gary Wagner read a proclamation thanking Spencer for his dedication to the church and the community. “I’ve known Lowell for a number of year. My actual introduction to Lowell was when I was a 19 year old kid coming to work for the City. Lowell was the water plant operator and he used to mow the grass,” Wagner said. “I went to the water plant one day and I could hear the backwash as it went through the filters and singing and preaching in the back. https://www.registerherald.com/wp-content/uploads/sites/41/2018/02/web1_Pastor2.jpgEaton City Council recognized Pastor Lowell Spencer for his longtime service during their meeting on Monday, Feb. 19.